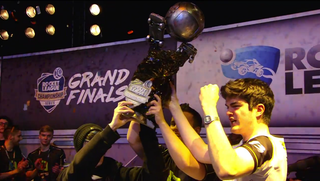 FlipSid3 Tactics just won the Rocket League World Championship in Amsterdam after beating grand final opponents Mockit Aces in two best-of-seven-series. After losing to Mockit Aces during the semifinals, FlipSid3 was sent down to the lower bracket where they managed to work their way back up to the top and earning a rematch. Since Mockit Aces never fell from the upper bracket, FlipSid3 had to beat them in not just one but two separate series. Ultimate, the Europeans ended up defeating their regional rivals four games to one in both. Despite how the scoreline looked at the end of the day, the matches were anything but a breeze. One of the few games that went to Mockit ended up going seven minutes into overtime. But it was Mark “Markydooda” Exton, who helped FlipSid3 hang with a number of truly stunning plays. The twenty year old Scotsman came out a hero, helping his team to victory at both ends of the field. Despite having to play so many more games, FlipSid3 were able to claw their way past NRG and Take 3 to make it back to the grand finals, only seeming to grow stronger as the tournament progressed. The team has managed to finish first in all except two of their last ten tournaments, and walk away from the Season 2 world championship in Amsterdam with $50,000 in prize winnings. You can re-watch the the grand finals and the rest of the tournament here.